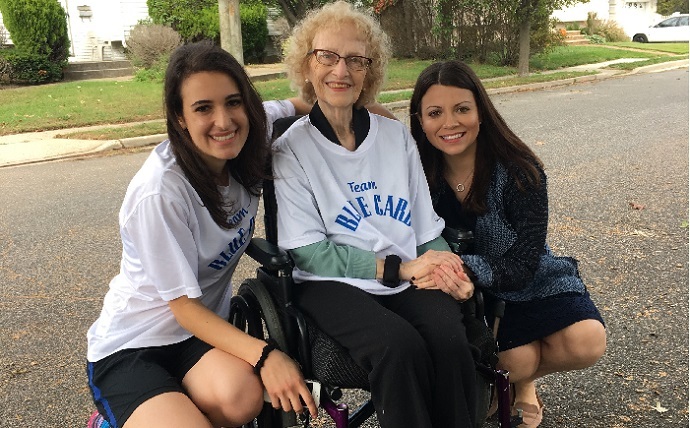 PHOTO: Blue Card volunteer Sarah Mizrachi, Holocaust survivor Irene Hizme and The Blue Card Executive Director Masha Pearl. April 11-12 marks Holocaust Remembrance Day or Yom HaShoah, a memorial of the 6 million Jewish people who died during World War II. The time to “never forget” has never been more vital. The Anti-Defamation League tracked that anti-Semitic incidents in the United States surged nearly 60% in 2017. The Blue Card, the only organization in the United States with the sole mission of providing ongoing support for medical care, rent subsidies, food and other basic needs to indigent Holocaust survivors, is urging that at the same time we remember the atrocities of the past, we act to secure the future well-being of Holocaust survivors. Now more than seven decades later, the majority of Holocaust survivors living in the U.S. today find themselves below the poverty level, trying to get by on less than $23,000 a year. Offer your time – a little companionship can go a long way. Companionship, affection and emotional support are basic relationship needs for us all, but can be priceless for Holocaust survivors. Many survivors have lost their families and do not have a strong support network that they can rely on, especially when an emergency happens. In fact, an estimated 75 percent of survivors live alone and many of these seniors have difficulty performing the routine activities of daily life. Providing company and friendship to elderly Holocaust survivors produces strong emotional health benefits for individuals that already went through so much. This could be a visit to their home for tea, a visit to their nursing home for a game of cards or driving them to the drugstore to run errands. Learn about volunteering opportunities through outreach to organizations such as Jewish Family & Child Service , Oregon Jewish Museum and Center for Holocaust Education or The Blue Card, which has a program that organizes visits to Holocaust survivors in the hospital. Don’t underestimate the power of listening. Listening to the experiences of survivors of the Holocaust who are still with us, in addition to recorded testimonials, will help give voice to a generation that will largely be lost to us in the next 10-20 years. Unfortunately, the window to hear first-hand testimonials is quickly closing. Whenever possible, take the opportunity to connect with survivors in your community so that their stories will live on after they are gone. You can find temples or community centers in your local area that host panels, guest speakers and movie screenings. Give back through activities that give you joy. You can volunteer to fundraise for Holocaust survivors through a variety of events and experiences such as endurance walks or runs. Joining a race through a charity team is a great way to give, while also getting to have an amazing personal experience with friends and family. The Blue Card takes part in various sporting events including the TCS New York City Marathon, the Miami Marathon and the New York City Triathlon. You can also give back while doing an everyday task like shopping online. Many organizations participate in Amazon Smile. When you enroll in the program, a portion of your purchase will be donated to the charitable organization that supports Holocaust survivors of your choice. Contribute what you can – any amount helps. Holocaust survivors that are now in their 80s, 90s and 100s have a steadily growing need for financial assistance to afford basic necessities from food to rent, and growing medical bills for dental care and cancer care. Donate what you can to improve the quality of life for your community members and neighbors. Engage with your employer to encourage a matching donations program. Share The Blue Card’s mission with your friends and encourage them to get involved and/or donate. You can learn about volunteering opportunities, make a donation online or arrange for a bequest in memory of a loved one, by visiting www.bluecardfund.org. The mission of The Blue Card is to provide direct financial assistance, with utmost respect and ever mindful of their dignity, to needy Holocaust survivors in the United States. Financial assistance is available on a monthly basis for most basic needs, as well as for emergencies, such as medical and dental care, special equipment, rent and utility shut offs, along with many other programs. For more information or to make a donation, please visit www.BlueCardFund.org, and follow on Facebook or Twitter @TheBlueCard. Founded in Germany in 1934, and reestablished in the United States in 1939, The Blue Card has distributed nearly $35 million to Holocaust survivors to date, with 100 percent of annual contributions made by individuals going directly to survivors. The Blue Card is Better Business Bureau (BBB) certified, and was named as one of the best Jewish charities by Federal Times.